Ed McGrath had only wanted one thing. It was his goal when he first started training in Isshinryu karate: to make it to brown belt. Brown belts, apparently, stood out as the most determined and spirited fighters in the dojo he trained at. Eventually he did achieve the rank of ikkyu (brown belt). He had been training at that level for some time when one day after finishing a round of basics, the chief instructor, Don Nagle, had everyone sit down. McGrath and another student were told to get up and were motioned to the center of the deck. One by one he was made to fight every student in the school. The year was 1959, and during karate's formitive years in the States, kumite was rough-and-tumble. Punches and kicks were rarely pulled, and knockouts were common. It should come as no surprise then that karate's ultimate rite of passage - the black belt test - was a brutal affair. After over twenty grueling matches, Ed McGrath was promomted to shodan (1st degree black belt). Master Nagle presented him with his own obi (belt) - the same one given to him a few years earlier by his sensei - Isshinryu's founder, Tatsuo Shimabuku. 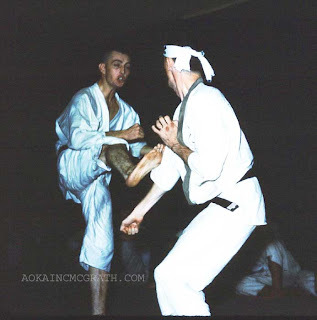 Ed McGrath eventually opened his own school, and in time gave away his black belt to one of his own senior students. Through the years, Don Nagle's original obi was passed down through one generation after another of dedicated students, each one realizing its significance. When Master Nagle passed away in 1999, the last student to receive this belt returned it to the Nagle family. In any act of giving or self-sacrifice we somehow gain something. I've never expected anything in return for all the belts I've given away. But I still have my original black belt and white belt. During his final days, Jigoro Kano - judo's illustrious founder and progenitor of the colored belt ranking system, asked to be buried with his white belt. "You can have my black belt; wear it proudly", he told one of his students. "Where I'm going, we're all white belts anyway." I think one of the aspects I like best about martial arts training is that you don't hold anything back. Whether you are sparring, doing kata, or teaching, you are encouraged to commit, or give, as much of yourself as you can. There is something very humbling in this act of trying to give as much as possible. Somehow, it seems to allow us to view ourselves and the world around us more clearly. I love this story! Anyone can go buy a belt, but the blood sweat and tears that are poured into it, is what makes it special. Especially in the practice of kata - if we hold back there, we only gyp ourselves. Welcome to my site, and thank you for your kind words. I was diagnosed with MS after only 3 weeks in the martial arts. I prayed I would at least make it to brown belt. I did. It figures it would've been something non-MS related that made me stop. Go figure. I remember this story. I also remember how Onshi Henry promoted me to Sho-dan these many years past. I would love to see it all return yet I have a feeling that is my age speaking. I love this post. How much it shows the mind frame of offering that which you have received as a tribute to those who gave it to you! a liability waiver would have to be signed. I can already imagine lawyers getting specialized in karate-derived accidents. It's true that most brown belts give it their all. Most Sensei I had were shodan. I have never had a nidan dedicated sensei. I guess the brown belts would get eclipsed. :-) Sensei will probably get there soon enough. And then I guess I'll see. I hear so much stuff for black belt testings. Incredible. I plan on simply going on like I do now. I don't have time for more. Be well and happy 2007! I think that the actual belt colour is not that important. Rather it is the way we hold Karate in our minds and translate it into physical action that is critical. ...lawyers getting specialized in karate-derived accidents. Just what we need - don't give 'em any ideas! I agree. But realize that my article deals far less with belt color than the act of giving. What a neat post John. Great story! My Ex gave me his old Black Belt because our Master gave him her old one. He said I helped him grow tremendously during our relationship. I'm not sure how I should take it.... We have taken taekwondo classes together. I am currently a blue belt and would theorethically have 2 belts to accomplish before reaching that status. I'm unsure of how to take it... whether an advancement in ranking from him as an instructor or just a sign of gratitude for being a big help in his life. ANy feeback guys? It's not a promotion as far as I'm concerned. I wouldn't wear it until you actually achieved the rank. It's an honor to receive such a keepsake, but your ex should've given you some instructions as to how and when to wear it.